The winner of the contest will receive a three ring designer wedding ring set featuring 2 women’s size 7 rings and a men’s size 10 ring. 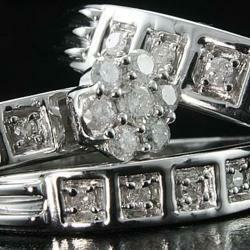 The rings are white gold rhodium over solid sterling silver and feature 21 cushion cut diamonds. PoliceAuctions.com is a website known for their listing of police auctions and government auctions. On August 3rd Police Auctions.com launched a Facebook contest on their Facebook Fan Page. Fans of PoliceAuctions.com only need to post a positive testimonial about PoliceAuctions.com on PoliceAuction’s fan page wall to be entered no purchase necessary. The winner of the contest will be determined by which comment receives the most “likes” by 4 p.m. Pacific Daylight Time August 31st. This is the second time this summer that PoliceAuctions.com has run a contest on their Facebook Fan Page. The first summer contest ended on July 31st, and the winner received a Collectors 1 Gram .999 Pure Solid Silver Bullion Bar. PoliceAuctions.com is finding new ways to fit into the new world of social media. The site is utilizing giants like Facebook and Twitter to connect users and build community. PoliceAuctions.com is interested in building an exciting and active Facebook community. PoliceAuctions.com recently quadrupled the number of fans on their Facebook.